A melting pot of images that describes Fabrica’s visual language. These walls bear witness to the creative energy of a community of young people from all over the world and once again highlight the importance of contemporary visual communication. Still images are presented alongside short videos that emphasize the same approach, stressing Fabrica’s focus on social themes, reality, art, globalization, experimentation and interdisciplinarism. The walls are divided into themes bringing together some of the projects produced by Fabrica over the years. 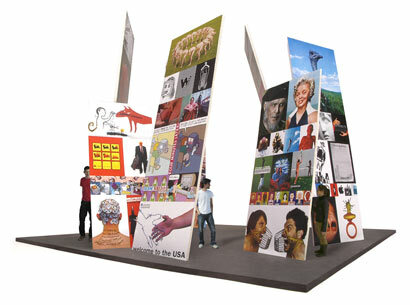 They include: international campaigns made for important social and non-profit organizations such as the World Health Organization, Amnesty International, Reporters Sans Frontières; posters about cultural products including books, music and films co-produced by Fabrica (such as No Man’s Land, winner of the Oscar for best foreign film) or art exhibitions designed by Fabrica (including Gonzaga, Canova and Mantegna); visual essays on world events (like Visions of change and Visions of hope about 9-11) and contemporary issues (including drugs, AIDS, diversity, football and religion); the “Wanted Creativity” series; experimentation about body and language; and illustrations and personal projects. Image of old Marylin, courtesy of Erik Ravelo (Cuba).